Seriously: What's not to like? I don't drink alcoholic beverages, which means I fail as a foodie in the eyes of some folks because I don't drink wine. I'm okay with that. Every now and then, though, a server who learns I don't want wine tries to persuade me to try something bottled and non-alcoholic. I almost never bother, for it's usually too sweet to be worth the trouble. During my second meal at Blue in January, however, I yielded to a very persuasive server because he was just so good and so nice that I decided to try some grape juice he offered. This grape juice. Wow, was it good! It was indeed very sweet, but somehow not as cloying as most grape juices I've tried, and it was a lovely complement to the meal. 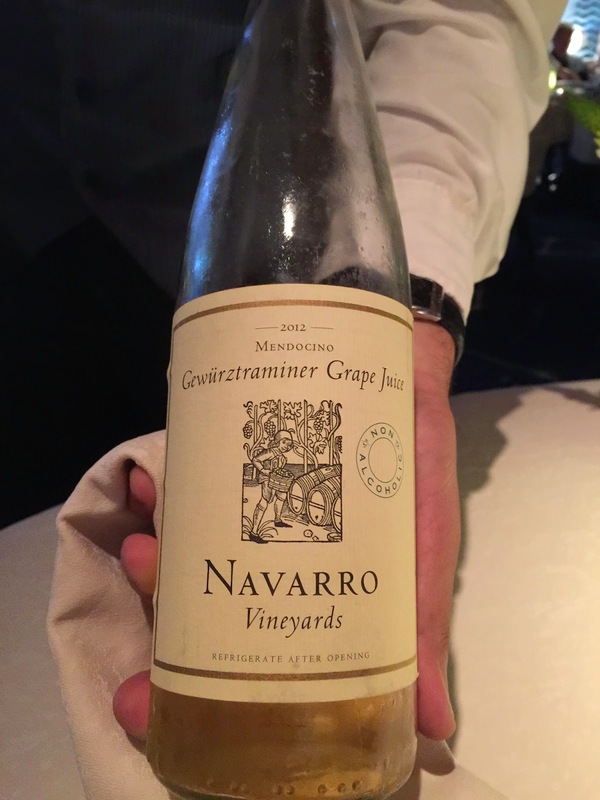 I've since read several folks online praising the grape juices from Navarro, so I hope to get to try more. If you ever get the chance to taste this one, I recommend it. Where else would you find all of these but in the newest episode of Now with PT? If the first trailer, which began with cars parachuting out of planes, wasn't enough to convince you that Furious 7 will indeed be as insane as its glorious predecessor, this one should do the trick. No, it's not enough that Vin Diesel drives a car through the air between buildings. He then has to roll out of the speeding vehicle as it crashes through the second building--and his tux keeps looking good. The good folks at TED have announced the program for TED2015. I look forward to watching those talks and engaging with my fellow attendees of TEDActive in Whistler, B.C. The premises and speakers in this program both look interesting, and the TED organizers are clearly holding back some surprises. Oh, in case you're wondering: yes, I'm jealous of myself for getting to attend this conference every year. 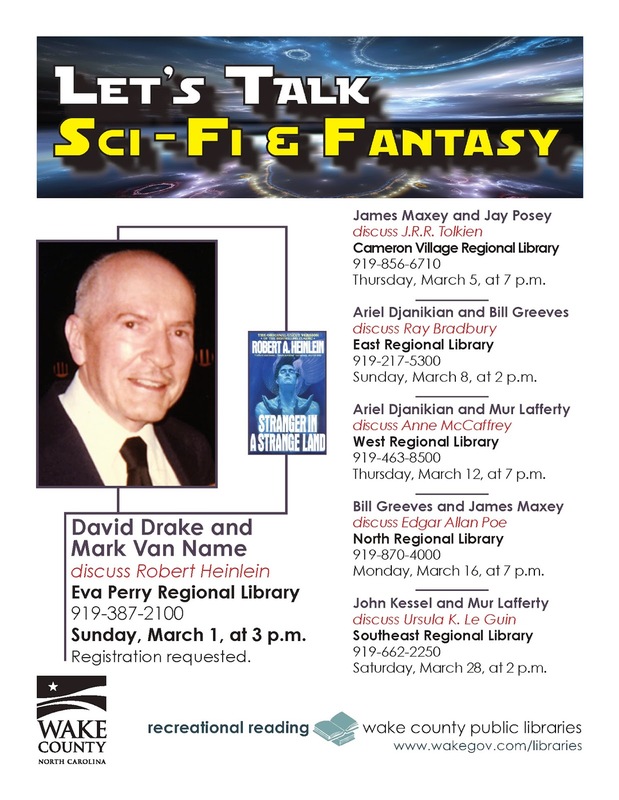 Granted, it's not as good a title as Sunday in the Park with George, but you could indeed spend part of a Sunday--March 1, to be precise--in a library (the Eva Perry Regional Library in Apex, NC) listening to David Drake and me discuss one of the giants of SF, Robert A. Heinlein. Check out this poster for the event. 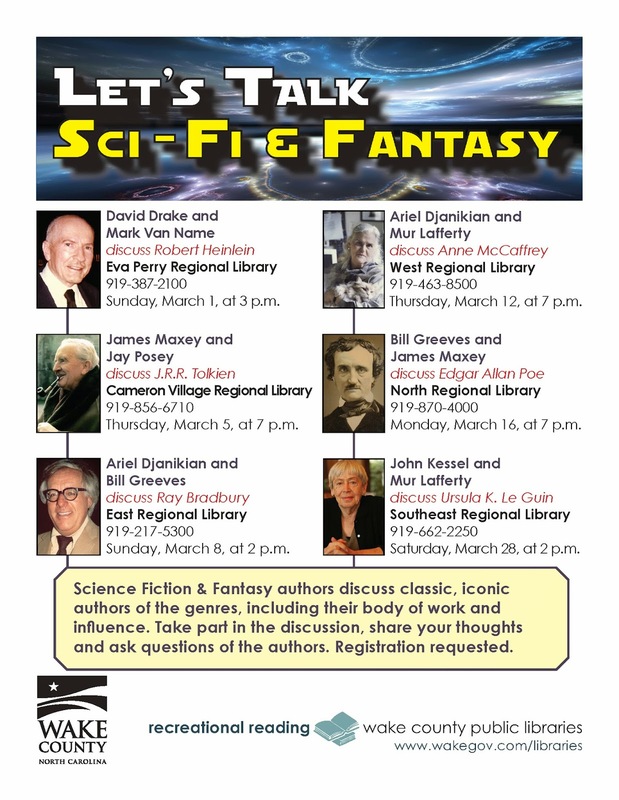 You'll notice that our talk is just one of many such events that the Wake County Public Libraries are running. Here's a poster that showcases them all. That's a great selection of classic authors and a good group of local writers discussing them. If you're free on March 1, come out and participate in the discussion; we'll be happy to see you. If you can't make our event, try to hit one of the others. We'll all do our best to make the talks entertaining and informative. You can't trust a Cone Man. When last we followed his adventures, he was sending local animals through a dimensional portal to his "dark lords"--creatures Holden proved to be thirteen-year-old boys in another dimension. 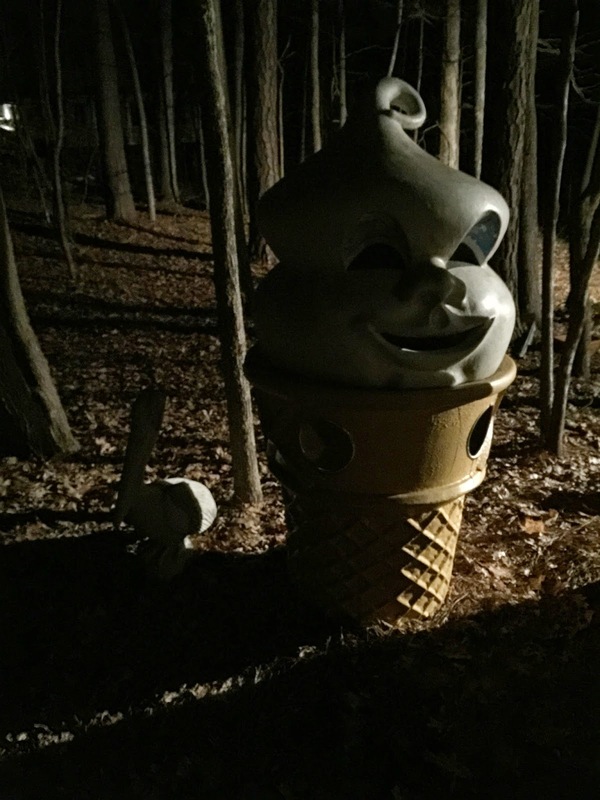 We had thought we were finally safe from the Cone Man, and that he had abandoned his hopes of becoming King Cone...but we were wrong. One night, the darkness beside his right arm hole sizzled like grease frying in the air, solidified, and became this. Unwilling to let them live in the darkness, we exposed the Cone Man's new friend, the evil pelican. 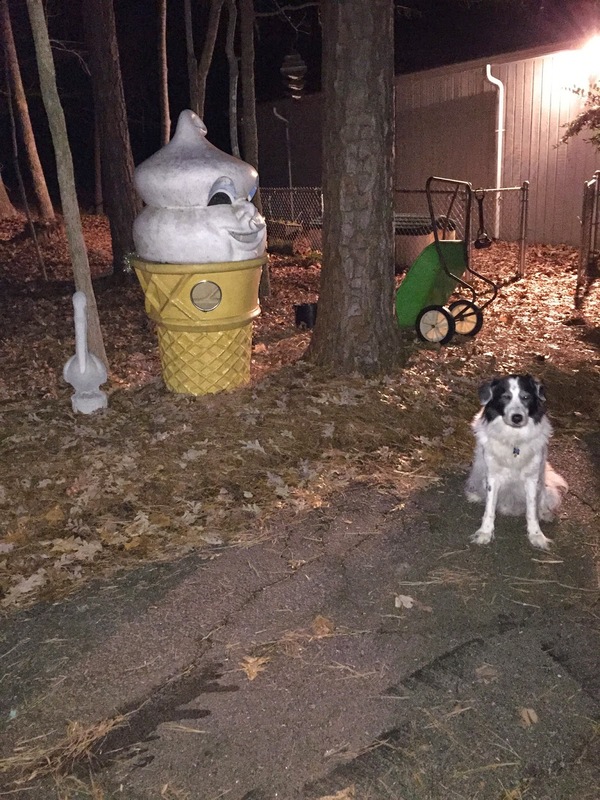 When I say "we," of course, I mean He Who Watches the Cone Man, Holden. Holden's superb senses led him to detect this cosmic disturbance immediately and to alert us to it. 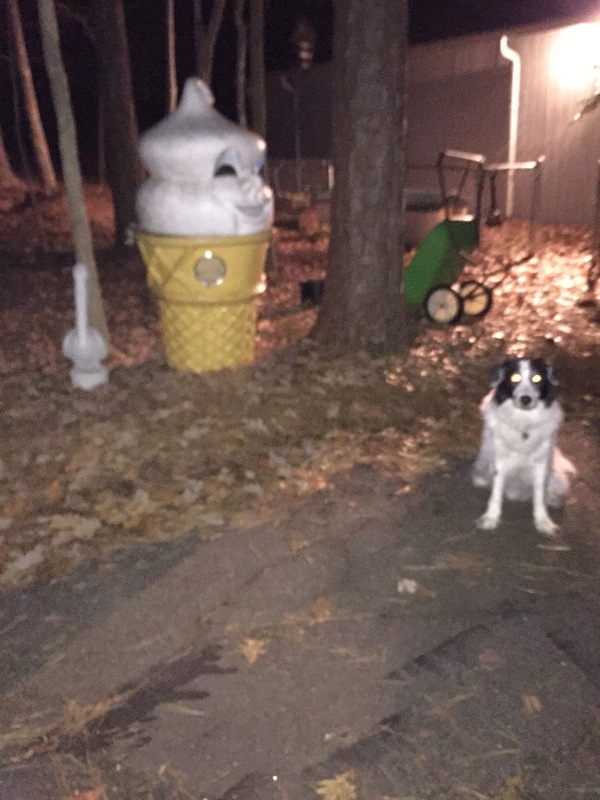 We were thus able to capture the end of the conversation between Cone Man and his new concrete friend. 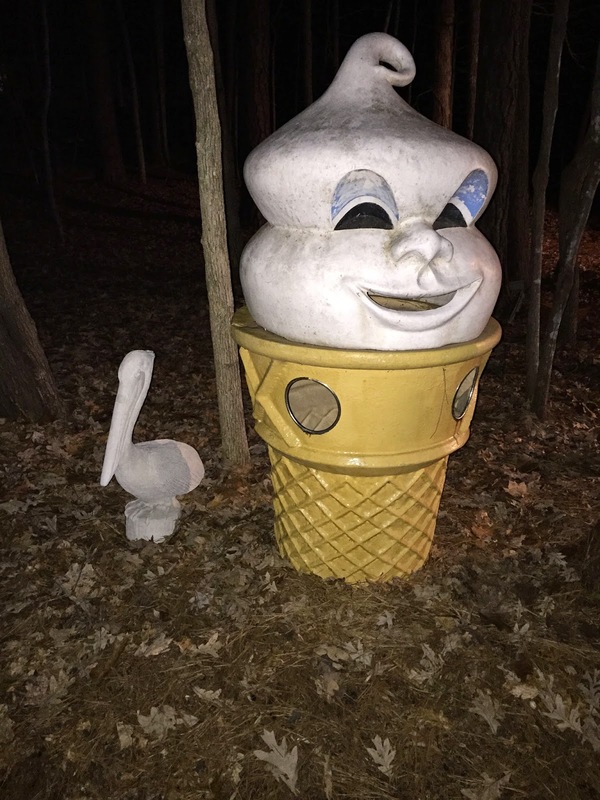 Cone Man: I don't care what you want. If the dark lords won't make me King Cone, I'm not going to help. Evil Pelican: Fine. Whatever. As long as we restart the flow of tasty animal flesh through the portal, you'll get what you want. CM: I can do my part, but exactly how are you going to help? In case you haven't noticed, you're concrete. EP: What is this concrete you speak of? I am having trouble moving, but I assumed it was simply the result of stiffness due to inter-dimensional travel. CM: No, you idiot. You're made of concrete. You can't move. EP: So fix it! What else are you good for? Get me out some flesh, and we can restart the feed line. CM: You sand-for-brains idiot, there's no fixing it! You need to go back and start over. EP: Okay, my tall friend, exactly how am I supposed to go back, when I can't freakin' move? At this point, Holden had heard enough. He turned on the area lights and tried reason. Holden: Excuse me, my two yard decorations, but I simply cannot tolerate any further talk of feed lines, pipelines, or dark lords. This area is under my protection, and protect it I shall. CM: Hah! Your days are numbered, short and furry. When pelican here unleashes his powers, you will bow before us. EP: That's right! Don't push me, or I'll unleash my...you know. H: Far be it from me to dash the dreams of any creatures, but as you are both aware, the pelican is concrete and unable to do anything beyond standing there and looking rather, well, if I must say, evil. I again insist that the two of you cease and desist all talk of menace. CM: And exactly what are you going to do if we don't? EP: Yeah, dog-breath, what can you do? H: Though it saddens me to resort to force, I will if I must. Do you really want to face the power of my yellow lasers of doom? CM: No! We're cool. Seriously. No laser eyes. No more threats. Right, pelican? EP: Threats? No threats. We were just joking. H: ...please do remember that I bring my laser eyes--and all of my being--to the task of protecting this world. EP: Yeah, yeah. So, Cone Buddy, what does concrete do all day? And so, once again, our the Earth is safe, thanks to Holden.